In a small to medium-sized sauce pan, heat the vinegar, water, dill, salt, and garlic until simmering. 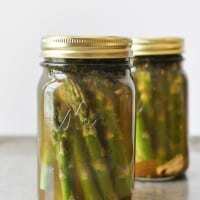 Trim the asparagus so that they’re short enough to fit inside a glass jar and place within. Pour the pickling liquid over the asparagus, seal, and let set for 8 hours (or overnight) in the refrigerator. Will keep for up to 4 weeks refrigerated. Note: this recipe will not result in shelf-stabled, canned pickled asparagus. These must be kept refrigerated as-written, though you could follow separate instructions for home canning if you’d like to make a larger batch for long-term storage.